Title: President and CEO, Supreme Development Inc.
By now, most people have heard of the “live, work, play” trend of development — the idea that new developments, or redevelopments, need a mix of different types of uses in order to create a vibrant place for people to both work and live. Such mixed-use projects — which usually include a combination of residential, retail and other commercial uses — are commonly associated with booming urban areas like Boston, Cambridge and Somerville, or Gateway Cities, where planning officials push the concept to revitalize downtowns. But in Dedham Square? Yes, Dedham Square, which has seen a revitalization of late, with new restaurants, shops and residential units opening in either new or converted buildings — and much of the transformation is at the hands of Giorgio Petruzziello, the son of Italian immigrants whose father is a longtime Dedham cabinetmaker. 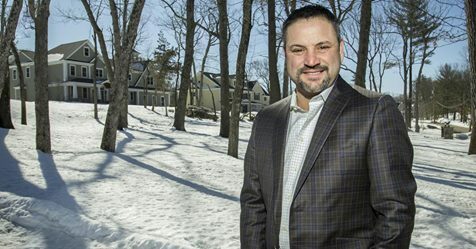 Over the past decade, Giorgio Petruzziello’s Supreme Development, via its Petruzziello Properties subsidiary, has overseen a number of mixed-used projects in Dedham Square, from the redevelopment of the old downtown Transcript building to his next project to redevelop an old car dealership. And Petruzziello has branched out of his native Dedham, as his company slowly transforms Westwood’s Islington Center from a small shopping center into what he hopes will be a mixed-used development that includes residential units. The result has been a resurrection, of sorts, of Dedham Square, pushed by people like Petruzziello and other developers and shop owners determined to keep their downtown quaint and competitive. Earlier this year, Lt. Gov. Karyn Polito took part in the grand-opening ceremony of a Blue Ribbon BBQ in one of Petruzziello’s properties. Not that Petruzziello has focused exclusively on Dedham Square over the years. As a youth, he worked in his father’s small cabinet company, Supreme Cabinets, helping to design, build, paint and install cabinets for customers. After high school, he bought his first home, financed with his own savings and via a bank-loan co-signed by his father, and successfully renovated it and later sold it off. He was off and running. Over the years, he’s built scores of single-family homes in Dedham, Westwood and Dover. His interest in mixed-use projects came later, late last decade to be precise, and he said he just thought it natural to have a combination of residential units, restaurants, retail shops and small commercial spaces within walking distance of each other. In other words, he was into “live, work, play” before it became trendy. Today, Supreme Development, which includes both Petruzziello Properties and Supreme Cabinet, combined revenue of about $10 million and 20 employees. Supreme Cabinet is still in operation, making custom cabinets, though it’s a now a fully automated company, Petruzziello notes. His father, Tony, still works at the company. Moving forward, Petruzziello said he sees his company tackling other mixed-use projects, perhaps branching off into other nearby towns. But he said the heart of his operations will always be in his native Dedham.